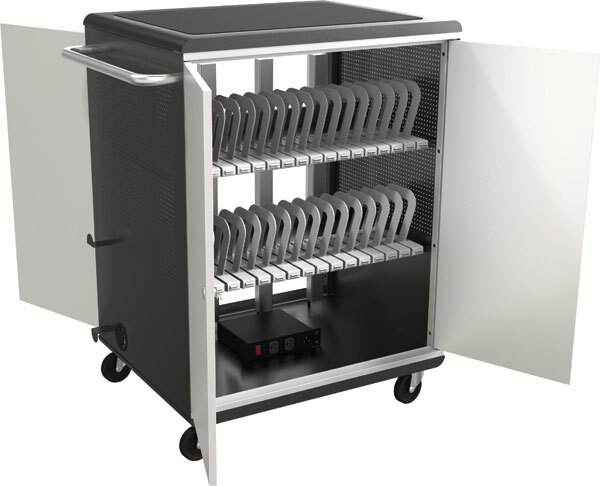 The Balt A La Cart Tablet Security Charge Cart stores and charges up to 32 tablets or netbooks in a secure, locking steel cabinet. Includes four 8-outlet power strips that connect to a single power cord that plugs directly into the wall, and features a built-in automatic timed switcher that avoids overloading the circuits by circulating power between each shelf in 15 minute increments. 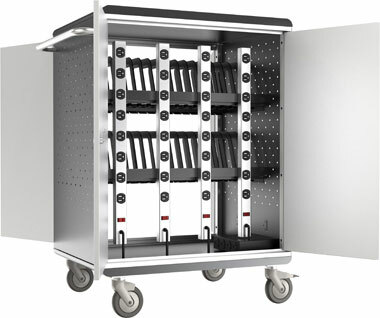 Plastic dividers keep devices neat and organized, and can be removed and rearranged as needed to accommodate a variety of device sizes and configurations (minimum slot size is 1.02"W). Vertical clearance between each of the two shelves is 8.85", with a depth of 13.18". 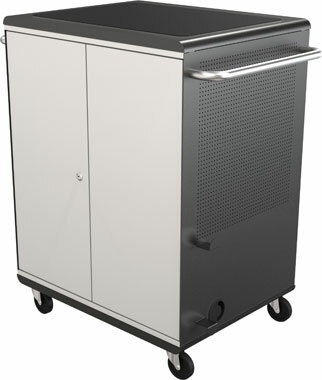 Bottom shelf is 8.93"H, providing additional storage space for AV Equipment and other supplies. 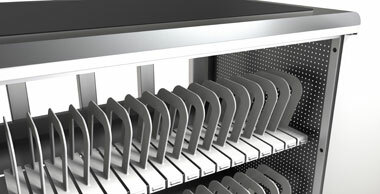 Non-skid top keeps devices in place and ventilated side panels provide heat dissipation to prevent overheating. 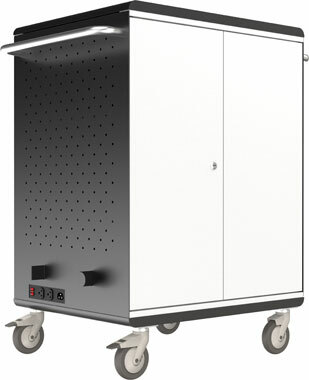 Other features include two audiliary power outlets (mounted on the side panel), an on/off switch, a cord winder, and heavy duty 4" casters (two locking). Ships ready-to-assemble.